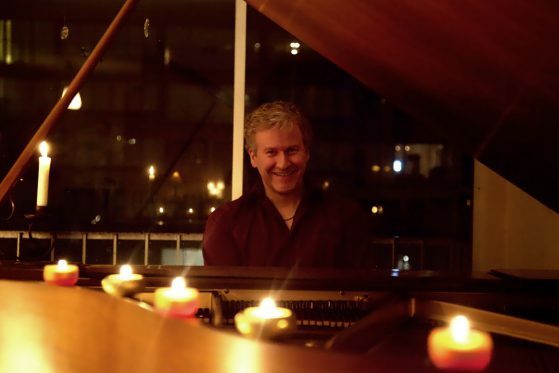 Vancouver pianist and composer Craig Addy was born in 1962 and has been improvising at the piano since he was a child. That child used to lie under the piano while his mother played beautiful classical music. 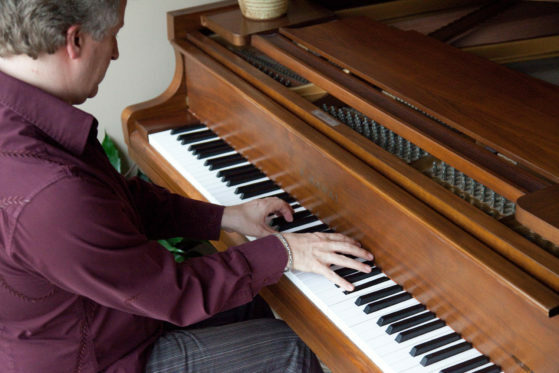 In 2007, while visiting Showcase Pianos in Vancouver, Craig found himself under a piano again. It had been over 30 years. The power of his childhood experience came flooding back, but this time with a conscious awareness of the effects the vibrations were having on his entire body. Craig combined his unique improvisational artistry with the experience of lying under his grand piano and began sharing this with people in his life. Childhood play and the adult boldness to be playful like a child is how “Under the Piano” was born. Craig has two music degrees: A B.Mus from the University of British Columbia and an ARCT Performer’s Diploma from the Royal Conservatory of Music in Toronto. First and foremost, Under the Piano is a musical experience – imagine having a personal private concert for one or two people. All the music that is played is spontaneously created and improvised in the moment especially for “you”. Why lie Under a Piano? Because it dramatically transforms your experience of sound and music. The sound vibrations a piano can produce are powerful and when you are Under the Piano you actually feel them with your body – it is a massage with sound. It impacts you both emotionally and physically. This is why Under the Piano effectively reduces stress and anxiety. Under the Piano is great for individuals, couples, and even small groups. Couples, friends, and family members come for a unique experience that they can enjoy together to celebrate their relationship. It’s great for birthdays, anniversaries, wedding gifts and special occasions like Valentine’s and Mother’s Day. There is room for two under the piano. I’ve occasionally had three smaller people under the piano too. Pregnant Mothers come to nurture both themselves and their baby and can then re-create the experience by playing the recording for years to come. Individuals dealing with grief and loss are getting great value out of Under the Piano as well – music directly accesses your emotions without words. Travellers. Do you have music loving guests visiting from out of town our another country? Send them for an Under the Piano session. Vancouver is the only place on the planet where you can enjoy this amazing and unique experience. Groups come too. Create an occasion for 4 to 8 people. During these sessions participants take turns lying under the piano while the others sit comfortably and enjoy the music. The piano you will lie under is the piano my mother bought when I was a child and which I lay under as she played beautiful classical music. We’ve been through many adventures and many hours of hard work together. I’ve never named my piano but I think of her as a “she” for whatever reason. Technically she is a 5′ 9″ Kawai KG-2 Grand Piano. That’s an actual grand piano as opposed to a baby grand and that’s why she accommodates two adults just perfectly. While I sometimes dream of owning a slightly bigger Fazioli, Bösendorfer, Bechstein or Steinway, I could never replace her. There would have to be room for 2 pianos.